In fifth grade, students learn how to conduct research using primary sources, how to write narratives that are reflective and theme-based, and how to write argument essays that use counterargument to clarify a position. Students are asked to deliberately use their knowledge of narrative craft to make their stories more thematic. Students draw inspiration and understanding from mentor texts, historical accounts, primary source documents, maps, and timelines to write focused research reports that engage and teach readers. Students grasp that form follows content, learning to take insights about their lives and decide whether these are best expressed in narratives, in essays, or in a hybrid genre created especially to convey the writer’s content. Fifth-graders learn to build powerful arguments that convincingly balance evidence and analysis to persuade readers to action. Begin drafting: Research-based argument essay: Do Zoos Help or Harm Endangered Animals? Think about everything you’ve learned today and this week. Write a research based argument essay convincing readers that zoos either help or harm endangered animals. Be sure to use what you know about writing essays to state a claim and back it up with evidence from your research. As you write, use info and quotations from the video and any or all of the texts you read to support your claim. BODY OF ESSAY...DON'T FORGET TO ADD INSIGHT AFTER EXAMPLES! INTRO TO ARGUMENTATIVE WRITING: ​I can brainstorm ideas for editorial-argumentative essays by considering topics I am passionate about. 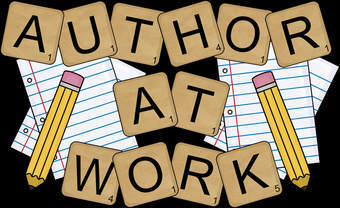 Link: Now that we have finished our show, feature articles and done some work in nonfiction reading, we will begin another important unit of study--editorial writing. 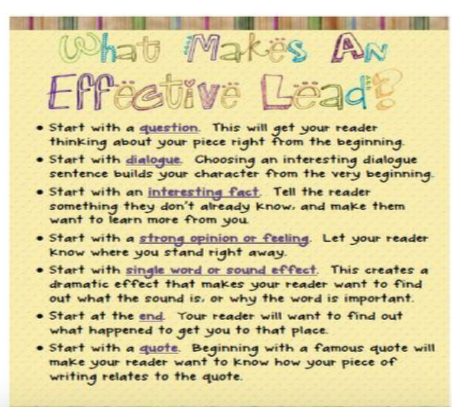 You will have the opportunity to write a persuasive essay also known as an editorial about a topic you are passionate about or care a lot about. However, for this unit, we are going to find topics that go a little bit outside our usual comfort zones. 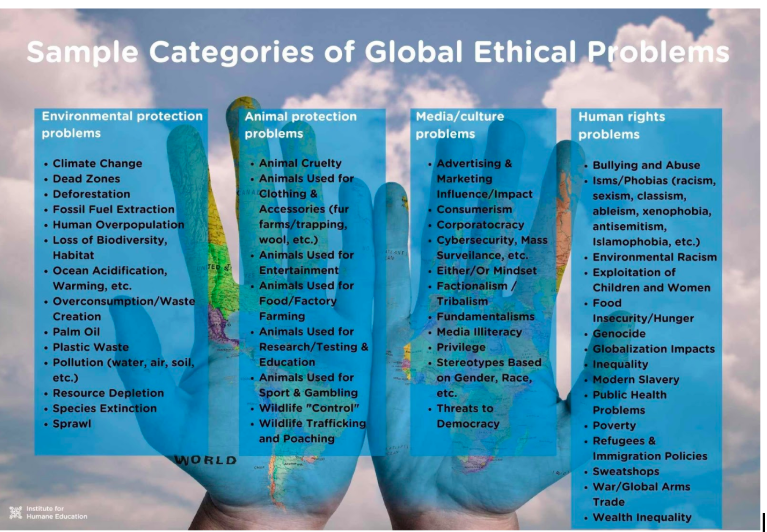 In other words, we are going to explore issues that affect and impact our community, nation and world in which we live in. 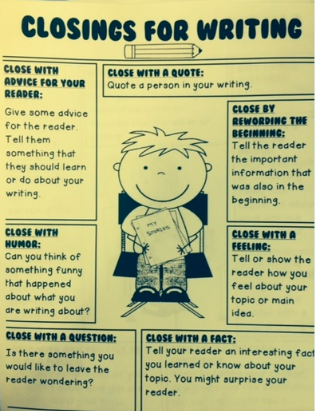 Teach: Writers write about topics they feel strongly about. Newspapers and online news sites have editorial pages where editors share their opinions about issues they care about. They then present evidence that supports their points of view. When I was thinking about topics I care about, I think about how we live in an internet world and social media age where even though a click of the mouse can connect us with people around the world, many of us feel isolated and lonely. I am concerned that online relationships may have replaced face to face social interactions and get togethers with others. How many of us still go outside regularly and talk to others? What about kids? Is all that screen time healthy? What impact does it have on our attention spans when we have millions of images and soundbites coming at us in fractions of seconds. What about how people are constantly arguing with each other online--bashing each other or anyone who disagrees with them. Independent: Today when you return to your notebook, begin generating your own list of topics. You can use some of these or your own. Try to come up with at least ten of your own. Think about topics and issues in the news and in the world that make you happy, sad, angry, excited, scared andjust generally concern you. Try to have at least 10. When you finish, choose one and begin writing off of it. You may jot down your thoughts and ideas in bullet list format or narrative paragraph format. For instance, here is a sample of what I may write in my entry about pressures for women to get married: Last weekend I went to a friend’s wedding. It was just the latest in an epidemic. Everyone I know seems to be tying the knot. Of course, once they’re done gushing about their own happiness, the next question is when are you going to? Like there’s something wrong with me...Why is there so much pressure to get married? Why are people so scared to be alone? 3. 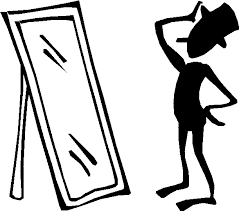 YOUR FEATURE SELF-ASSESSMENT--DON'T FORGET THIS! ​ANSWER THE FOLLOWING QUESTIONS AS HONESTLY, THOUGHTFULLY AND THOROUGHLY AS POSSIBLE. PLEASE COPY AS A WORD DOCUMENT AND TYPE YOUR RESPONSES. 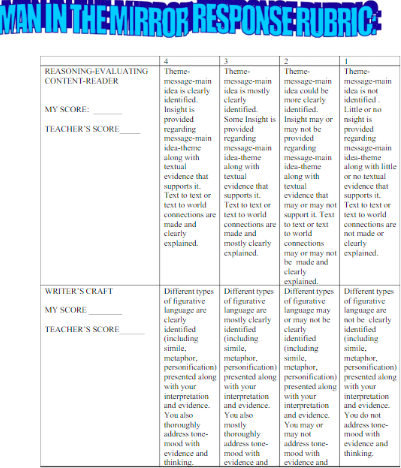 (PLEASE ALSO REVIEW FEATURE RUBRIC AS YOU GET READY TO PREPARE YOUR STORIES FOR PUBLICATION. REMEMBER TO HAND IN TWO COLORED COPIES OF YOUR ARTICLESOR AT LEAST ONE). EMAIL ONE COPY TO YOUR TEACHER. Why did I choose to write about this story? 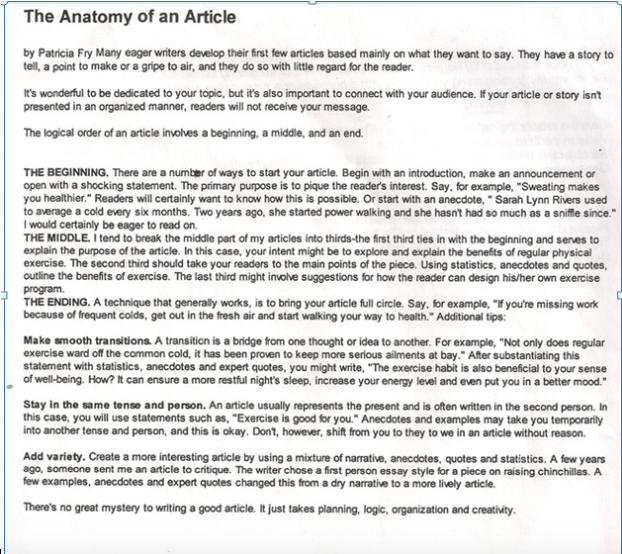 Focusing on what your audience needs to know, what was the purpose of writing your article? In other words, what is the angle of my piece? List at least two places where my angle is clearly evident. What kind of lead did I choose for my story? Why? What kind of ending did I choose for my story? Why? F. Informational Feature (This type of article shows insightful coverage of a topic. • It gives detailed information focused on one aspect of a given topic. 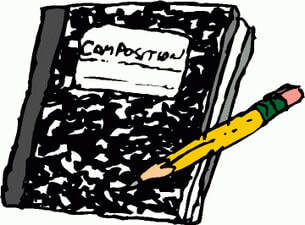 the writer makes a personal connection to the subject and includes his/her voice). What did I learn about voice-style-craft (this includes using second person narrative, descriptive language and using parenthesis to direct reader directly) from this unit? Give an example of where your voice is clearly evident. What is a subheading? List at least two that you used. Explain how you managed to slant your article without specifically stating your personal opinion and writing in first person narrative. IN OTHER WORDS, WHERE DOES YOUR PASSION AND ENTHUSIASM FOR YOUR TOPIC COME THROUGH BEST? 8. How did you grow as a writer during this unit of study? 9. What do you think you could do even better the next time? I can determine where my writing needs elaboration by meeting with a partner to discuss questions they still have about the information in my article. 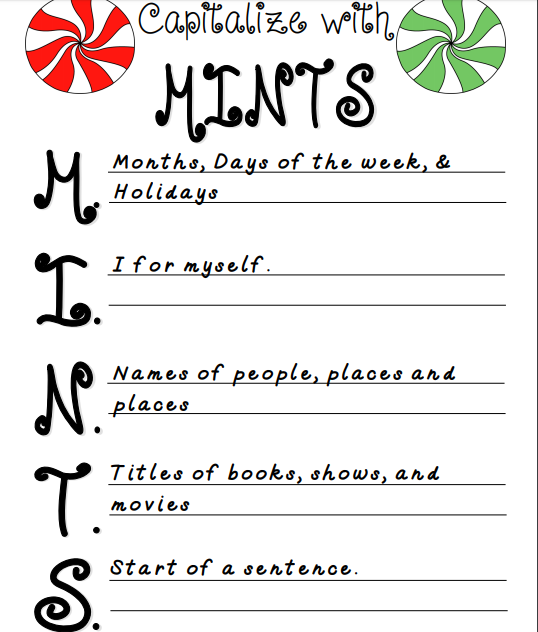 (See notebook lesson for more details). Peer conferences for features. What writing partners do? What Do Writing Partners Do? 1. Read partner’s piece thoroughly and carefully. 2. Find the particular thing that you liked in someone’s writing and make a positive comment about it. 3. Ask a question about something you didn’t understand or something you are curious about. Look for parts that are not clearly explained or parts where you still have questions about the facts. Write your questions for each paragraph on a separate post-it. Share the questions and comments that you had, with your partner. IS MY WRITER'S VOICE ENGAGING AND USED? (DO I SPEAK DIRECTLY TO THE READER? ETC). 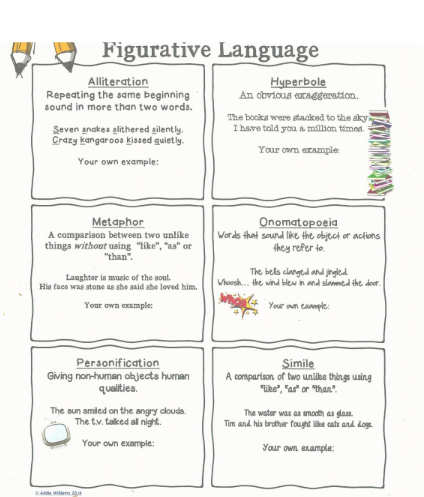 DID I INCLUDE DESCRIPTIVE AND FIGURATIVE LANGUAGE TO SUPPORT MY MAIN IDEA? DOES MY ARTICLE CONTAIN LOTS OF FACTS BUT READS LIKE A FEATURE AND NOT A RESEARCH REPORT? ARE MY TRANSITIONS SMOOTH AND ERROR FREE? DO I HAVE AT LEAST TWO SUBHEADINGS THAT ARE BOLDED AND HELP ORGANIZE MY INFO? DO I HAVE AT LEAST TWO PHOTOS WITH CAPTIONS THAT SUPPORT THE MAIN IDEA? DID I INCLUDE AN EXCELLENT AND ENGAGING LEAD FOLLOWED BY A NUT GRAF THAT STATES MAIN IDEA OF MY ARTICLE? DID I INCLUDE A BIG BANG ENDING? I can create a fab feature by “Making it Lively.” Mentor text: Predator. Connect: With features, it is not enough to just teach or inform. We also need to entertain so we do not put our readers to sleep. An anecdote is one way to do this. Today, we will look at other ways. • What makes it interesting? As you begin drafting, try writing a detailed paragraph about your topic. Make sure it is wide awake and sentences are brought to life. Also, try writing at least two anecdotes (two short stories/scenes) that would support the main idea/angle of your feature. I can support the facts in my fab features by Using meaningful quotes. Link: You have all have begun writing some fascinating features. Today, we will look at how quotes can be used to support your angle/main idea and how to choose good ones while avoiding empty quotes. Teach: When you write features, you need both facts and memorable quotes. Nothing is as powerful as the human voice. You can have a pile of wonderful stats but the spoken word will bring your story and subject to life! Think of how a quote may strengthen your writing. You may quote eyewitnesses or experts. You should quote a person in their own words but it should be interesting and exciting. It should not only state your fact or point but bring color or excitement to it. A quote could even be a great way to begin or end your story. You also want to avoid using empty quotes that do not add much to your story. Don’t use too many quotes. While it can be tempting to include the interviewee’s own words in the story, don’t rely too much on quoting them. Otherwise, this becomes more of a straightforward interview. Write around their quotes to give them context, build the story and help the reader interpret what the interviewee is saying. • Do you have important facts that are buried and not fully explained? • Are there any places where the reader may not understand the importance of what you have written? You may need to add a sentence to explain why it is important. MLA CITATION MAKER: BE CAREFUL WITH ADS. 1. To make a point without being overbearing. 2. To use an example helping to clarify a position or point of view. 3. To encourage and inspire others. 5. To remember an historical event and or Person. 6. Anecdotes are used to take factual information and get it to stand up and reveal the essence and heart of your story! GIVE THE READER DETAILS. INCLUDE AT LEAST ONE OR TWO QUOTES FROM PEOPLE YOU INTERVIEWED. BE OBJECTIVE (DON'T COME RIGHT OUT AND STATE YOUR OPINION.--I THINK THIS OR THAT). HOWEVER, YOUR FEATURE IS ANGLED WITH FACTS AND QUOTES THAT DO INDEED SUPPORT HOW YOU FEEL AND HOW PASSIONATE YOU ARE ABOUT SOMETHING. I can revise my Mango essay by revisiting the hamburger essay format. Writing an essay is like making a hamburger. Think of the introduction and conclusion as the bun, with the "meat" of your argument in between. The introduction is where you'll state your thesis, while the conclusion sums up your case. Both should be no more than a few sentences. The body of your essay, where you'll present facts to support your position, must be much more substantial, usually three paragraphs. Like making a hamburger, writing a good essay takes preparation. Let's get started! The meat in the middle, called the body of the essay, is where you'll offer evidence in support of your topic or thesis. It should be three to five paragraphs in length, with each offering a main idea that is backed up by two or three statements of support. The bottom bun is the conclusion, which sums up the arguments you've made in the body of the essay. Like the two pieces of a hamburger bun, the introduction and conclusion should be similar in tone, brief enough to convey your topic but substantial enough to frame the issue that you'll articulate in the meat, or body of the essay. Before you can begin writing, you'll need to choose a topic for your essay, ideally one that you're already interested in. Nothing is harder than trying to write about something you don't care about. Your topic should be broad or common enough that most people will know at least something about what you're discussing. Technology, for example, is a good topic because it's something we can all relate to in one way or another. Once you've chosen a topic, you must narrow it down into a single thesis or central idea. The thesis is the position you're taking in relation to your topic or a related issue. It should be specific enough that you can bolster it with just a few relevant facts and supporting statements. Think about an issue that most people can relate to, such as: "Technology is changing our lives." Once you've selected your topic and thesis, it's time to create a roadmap for your essay that will guide you from the introduction to conclusion. 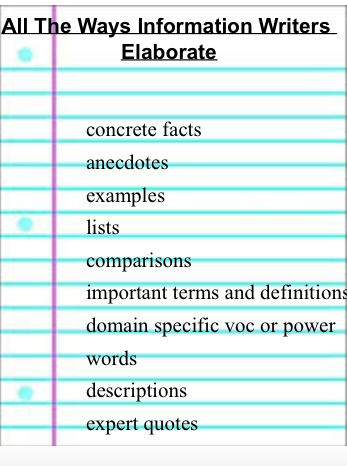 This map, called an outline, serves as a diagram for writing each paragraph of the essay, listing the three or four most important ideas that you want to convey. These ideas don't need to be written as complete sentences in the outline; that's what the actual essay is for. Note that the author uses only three or four main ideas per paragraph, each with a main idea, supporting statements, and a summary. Once you've written and refined your outline, it's time to write the essay. Begin with the introductory paragraph. This is your opportunity to hook the reader's interest in the very first sentence, which can be an interesting fact, a quotation, or a rhetorical question, for instance. Forbes magazine reports that "One in five Americans work from home". Does that number surprise you? Information technology has revolutionized the way we work. Not only can we work almost anywhere, we can also work at any hour of the day. Also, the way we work has changed greatly through the introduction of information technology into the workplace. Notice how the author uses a fact and addresses the reader directly to grab their attention. Once you've written the introduction, it's time to develop the meat of your thesis in three or four paragraphs. Each should contain a single main idea, following the outline you prepared earlier. Use two or three sentences to support the main idea, citing specific examples. Conclude each paragraph with a sentence that summarizes the argument you've made in the paragraph. Let's consider how the location of where we work has changed. In the past, workers were required to commute to work. These days, many can choose to work from the home. From Portland, Ore., to Portland, Maine, you will find employees working for companies located hundreds or even thousands of miles away. Too, the use of robotics to manufacture products has led to employees spending more time behind a computer screen than on the production line. Whether it's in the countryside or in the city, you'll find people working everywhere they can get online. No wonder we see so many people working at cafes! In this case, the author continues to directly address the reader while offering examples to support their assertion. The summary paragraph summarizes your essay and is often a reverse of the introductory paragraph. 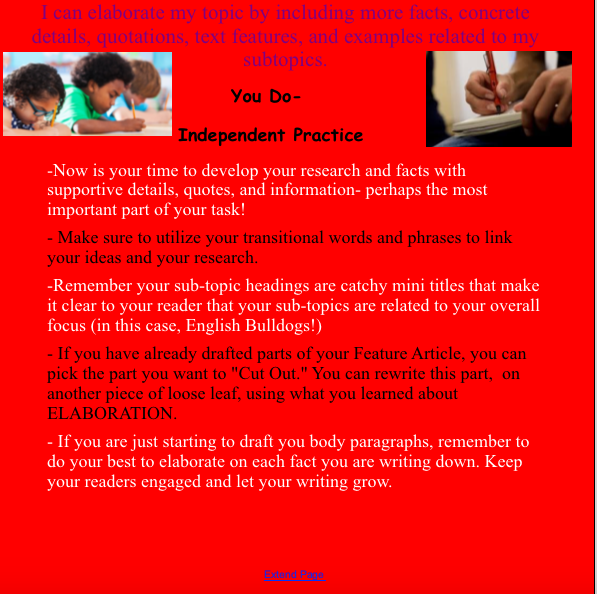 Begin the summary paragraph by quickly restating the principal ideas of your body paragraphs. (next to last) sentence should restate your basic thesis of the essay. Your final statement can be a future prediction based on what you have shown in the essay. In this example, the author concludes by making a prediction based on the arguments made in the essay. Information technology has changed the time, place and manner in which we work. In short, information technology has made the computer into our office. As we continue to use new technologies, we will continue to see change. However, our need to work in order to lead happy and productive lives will never change. The where, when and how we work will never change the reason why we work. PART ONE: YOU MAY ANSWER INDIVIDUALLY OR COMBINE FOR A FOUR PARAGRAPH NARRATIVE RESPONSE. ANALYZING TEXT: MEANS THAT YOU ARE LOOKING CLOSELY AT JUST ONE PART OF A TEXT. YOU ARE PICKING IT APART AND FINDING OUT WHAT THE TEXT REALLY MEANS. CHOOSE ONE LINE FROM THE SONG. WHAT DOES THIS LINE MEAN? HOW DO YOU KNOW? AUTHOR’S PURPOSE: TO INFORM, TO PERSUADE OR TO ENTERTAIN. THOSE ARE THREE REASONS WHY AUTHORS WRITE. BUT NOW IT’S TIME TO THINK A BIT MORE DEEPLY. WHAT WORDS FROM THE LYRICS HELP YOU UNDERSTAND THE AUTHOR’S PURPOSE? WHY DID THE AUTHOR MOST LIKELY WRITE THIS SONG? PROVE IT BY USING TEXT BASED EVIDENCE. THEME IS THE MESSAGE. BEGINS WITH INDIVIDUAL WORDS LIKE HOPE, FRIENDSHIP OR PERSEVERANCE. DESCRIBE THE THEME USING INDIVIDUAL WORDS. WHAT WAS THE MAIN MESSAGE OF THE SONG? BACK UP YOUR THEME WITH EVIDENCE FROM THE TEXT. MAKE A CHANGE. WHAT CAN YOU DO TO MAKE A CHANGE IN THE WORLD? WHAT PROBLEM DO YOU THINK NEEDS TO BE CHANGED? WRITE THREE SPECIFIC WAYS YOU CAN SOLVE THIS ISSUE. themselves? For others? When people don’t take responsibility for their community, what can be the consequences for themselves? For others? HOW CAN WE CHANGE THE WORLD BY CHANGING OURSELVES? WHAT IS THE POWER OF ONE PERSON (THE POWER OF ONE) TO CREATE CHANGE? · It was a pretty morning. · He was a good boy. · The food was good. These are all telling sentences and we know that good writing shows and does not tell. And even though they tell, they sure don't tell much. The reader is left with questions and uncertainty because of a lack of details. When we crack open words and phrases we're trying to get to the show of the sentence. The process is easy. When you find a word, phrase, or sentence that tells, stop; envision the person, place, or thing; and give words to what you see in your mind. Then use the words that describe what you envision as you rewrite. Let me show you some examples and let you practice a couple of examples, too. It was a pretty morning. The palms swayed as the sun rose in the cloudy sky. Trevor was as good as a boy scout (and just as trusthworthy). Crack open at least one sentence. Use a post it to create interesting one. Begin your own personal thesaurus (word treasury) by finding at least two tired over used phrases/words and begin listing alternative words/phrases. (You may use a thesaurus). Try re-visiting your own pieces and cracking open sentences and words that are overused and fixing them. Try using them in your own writing (see if they make sense). Also, try keeping a list of words you over use and find alternatives. Use a thesaurus and your imagination. Connect: Just like in Tackle Box where Ralph Fletcher wrote a narrative off something special that brought back memorable moments, we have objects that hold special meaning to us. They can give us good ideas for writing. ***MAKE SURE THE MESSAGE-BIG IDEA THAT YOU WANT TO EXPRESS WITH YOUR READER IS CLEARLY EVIDENT THROUGHOUT YOUR PIECE-ENTRY. FIGHT SONG-THINK ABOUT THE OVERALL MESSAGE. WHAT IS THIS SONG REALLY ABOUT? HOW DO YOU KNOW? Writing workshop: Writing extended metaphor. 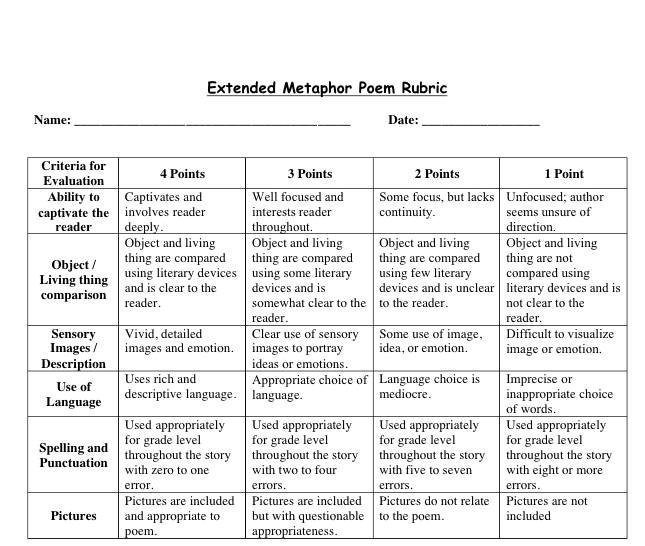 How can we write extended metaphors? By writing extended metaphors, students will use sensory details to convey experiences and events precisely. .
Write a new entry in your notebook that incorporate metaphors or extended metaphors..
WRITE YOUR OWN EXTENDED METAPHOR THAT INCORPORATES THE STRATEGIES WE HAVE BEEN UTILIZING IN CLASS. PUBLISH WITH IMAGES, CORECT FORMAT-COLUMNS BY MONDAY, OCTOBER 21ST. FIRST DRAFT IS DUE THURSDAY, OCTOBER 17TH OR SOONER. STRATEGIES TO ASSIST THAT WE WORKED ON IN CLASS: We practiced writing a description of someone or something using this device. For example, if you want to say my dad is my teddy bear. You can go on to say things like he wraps his big arms around me. I love hugging him. He feels soft and warm. When I am sad, I can look into his big brown eyes and feel secure. He laughs heartedly from his round belly that protrudes slightly from his pants and that makes me smile. Practice writing your own extended metaphor. We can then publish—with illustrations-images. The sergeant barked commands to his men. The farmer disliked the roar of city streets. My mother is an angel. The student sailed through the test. A sentence telling how you felt when you found out you had failed a test. RULES:1. Save everything, it’s all part of the history of the piece of writing, plus you never know what you might want to come back to later and use. 2. Date and label everything you write to keep track of what you’ve done. 3. Write on one side of the paper only, and always double space. Both will make revision, polishing, and editing easier and more productive. 4. Draft your writing in sentences and paragraphs. 5. Get into the habit of punctuating and spelling as well as you can while you’re composing. 6. Understand that writing is thinking. Do nothing to distract the other writers. Don’t put your words into our brains as we’re struggling to find our own. Instead, find your private, internal writing place, lock the door and listen to your voice. 7. Whisper when conferencing with teacher and peers. 8. Use the conference area for peer conferencing, and complete the Peer Conferencing Sheet so the writer has a record of what was discussed and can form a plan of action. 9. When you’re stuck or uncertain, use the resources available to you in this room, including your writing notes and your lists of writing topics, and tap the techniques you’ve been shown in conferences and mini-lessons. 10. Everything you intend to publish needs revision. One draft is never enough. 11. Self-edit as completely as you can in a different colour, and complete an editing checklist to show what you know about conventions of writing. 12. When a piece of writing is finished, clip or staple everything together, including drafts, notes, lists, editing checklist, and peer conference form. File it in the publish section of your binder, with the final copy on top. 13. 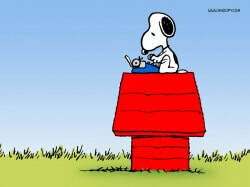 Write as well and as much as you can, and work hard; dedication makes a good writer. MOST IMPORTANT: Carry your notebook with you at all times. You never know when you will be inspired to jot down your story ideas or observations. 1. Find topics and purposes for your writing that matter to you, your life, who you are, and whom you want to become. 2. Keep a list of your possible topics as a writer. 3. Try new topics, purposes, audiences, genres, forms, and techniques. 4. Make your own decisions about what’s working and what needs more work in pieces of your writing. Be the first responder to your writing, and read yourself with a critical, literary eye and ear. 5. 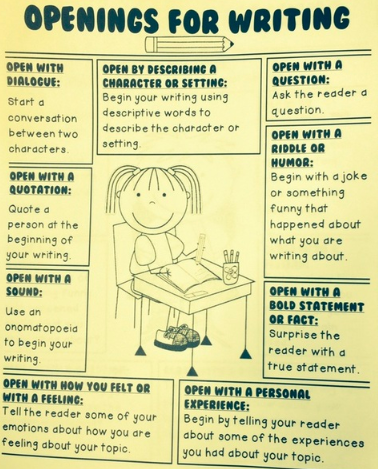 Listen and ask questions about and comment on others’ writing in ways that help them improve their writing. 6. Take notes of information presented in writing mini-lessons, recorded chronologically. 7. 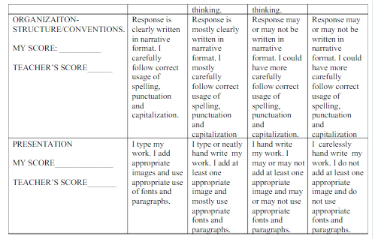 Recognize that readers’ eyes and minds need your writing to be conventional in format, spelling, punctuation, and usage. Work toward conventionality and legibility, and use everything you know about format, spelling, punctuation, and usage as you compose. 8. Take care of the writing materials and resources. 9. Each day, establish and work toward significant, relevant goals for yourself as a writer. 10. In every writing workshop, take a deliberate stance toward writing well: try to make your writing effective and use what you’ve been shown in conferences and mini-lessons to help you get there. 11. Work hard in writing workshop. Remain focused and on task during class.